Retailers will sometimes offer certain items at a special price if the cusotmer buys more than one piece of merchandise. Frequently retailers offer special pricing whenever a customer buys a half-dozen or dozen of the same item. To handle these cases, you need to use XpertMart™'s Quantity Prices Catalog. When the Quantity Prices Catalog opens up, create a new entry for every item that you wish to establish a special price by quantity for. There are two ways you can enter the item into the catalog: by entering the item number into the "Item Number" field, or by opening the Items Catalog with the zoom button at the right and finding the item you are looking for (usually through a Query by Example) and pressing <OK>. Once you enter an item you will see the Item Details section of the catalog automatically filled-in. In the example below, the user has entered item number 203 which corresponds to the Black Size 6.0 Sun Jammers shoe. Once you've chosen an item, you must select the price list you are modifying. Recall that there is one entry in the Prices Catalog for every price list you create. If you want the special price by quantity to apply for every price list you need to create an entry in the Quantity Prices Catalog for every entry in your Price Lists Catalog. (If you currently have three price lists and want the special price by quantity to apply for each one, you need to create three entries in the Quantity Prices Catalog). Usually, however, you only want the quantity pricing to apply to one price list, such as the Wholesale price list. The next step is to define a range for which the special price takes effect. Enter the beginning of the range (inclusive) in the "Quantity From" field and the end of the range (inclusive) in the "To Quantity" field. For example, if you want a special price to take effect if the customer buys between 3 and 6 items you would enter 3 in the "Quanity From" field and 6 in the "To Quantity" field. If you want yet another special price to take effect if the customer buys 6 or more items you need to create a new entry in the Quanity Prices Catalog using 7 in the "Quantity From" field and 9,999 in the "To Quantity" field. Entering 9,999 in the "To Quantity" is a good way to represent "or more" as a quantity. This is because customers are most unlikely to buy more than 10,000 of a single item. In the "Price" field enter the special price that would take effect if the customer buys the amount of merchandise that falls within the range you've defined. In the example above, any customer buying 3 or more Black Size 6.0 Sun Jammers will pay $35.99 instead of the normal $45.99 price. When you've entered the special price into the "Price" field, the margin and discount fields will automatically get filled in reflecting the new margin you will receive with the special price and the discount it represents off of the previous price. 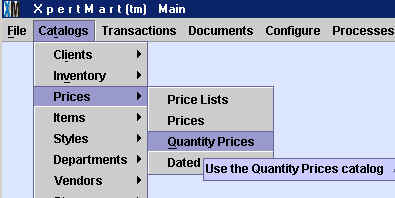 Any time you enter an item quantity into an Invoice greater than 1, XpertMart™ automatically checks if a special price by quantity exists for the price list being used. You do not need to "activate" this process. If you do not want to use prices by quantity, simply erase all entries in the Quantity Prices Catalog. XpertMart™ will only use the special price in the Quantity Prices Catalog if it is less than the current price in the corresponding price list being used, under the assumption that the customer will always demand the lowest price. (This could occur if you changed prices but neglected to adjust the Quantity Prices Catalog accordingly). Similarly, if you are using Dated Prices, XpertMart™ will look for the option that generates the lowest price for the customer. IMPORTANT NOTE: XpertMart™ assumes that there is only one special price per item, per price list for a given quantity range. Whenever it finds one, it stops looking for more. Therefore, it is the user's responsibility to make sure there are no duplicate entries in the Quantity Prices Catalog as there is no guarantee which one XpertMart™ will use.